RECENT SURVEY DONE JULY 2014 VESSEL HAS ALWAYS BEEN IN FRESH WATER WINTER STORED INDOORS This 48 Ocean is a must-see. All service is up to date. Call to make an appointment. United Yacht Sales New Jersey would love to guide you through a personal showing of this 48' Ocean Yachts Super Sport 1988. 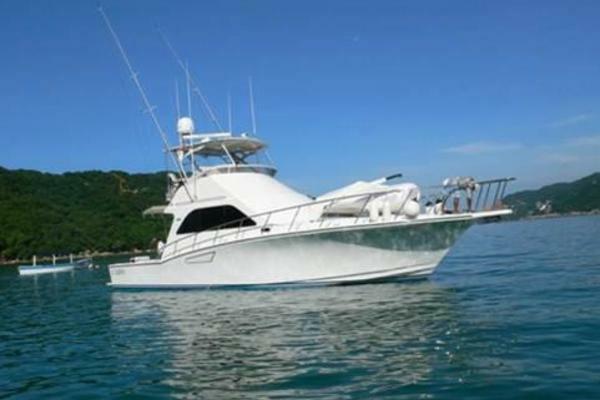 This yacht for sale is located in 1000 Islands, New York and priced at $109,000. For a showing please contact us by filling out the form on this page and we will get back to you shortly! A bestseller for Ocean during the late 1980s, the 48 Super Sport was built on a stretched 46 Super Sport hull with new deck and superstructure styling and a slightly enlarged cockpit. She’s a good-looking boat even today with her Jersey-style profile and aggressive appearance, but even more notable is the fact that she could turn an honest 30 knots with standard 485hp 6-71 diesels. Built on a lightweight hull with a narrow beam and a very modest 2 degrees of transom dead rise, she’s quick to accelerate but a stiff ride in a chop thanks to her flat-bottom design. The 48 is equipped with the conventional two-stateroom, galley-down floor plan with a more open salon. The interior woodwork and trim are varnished teak, and the array of standard equipment included cockpit controls, tackle center with freezer, teak cockpit sole, and teak covering boards. Sleeps 4 owners and guests in two staterooms for a total of 4 berths.One master head and shower, one guest head and shower.This is a Galley down, two stateroom, two head 48' Ocean. Sleeps 4 owners and guests in 2 staterooms, plus 2 settee berth for a total of 6 berths. The master stateroom is forward with head, shower and Queen-sized bed. There is 1 guest head and 1 guest shower.